If you are like me and you love foie gras, then you are sure to have some scraps of the uncooked product after you have finished cleaning it. This is especially the case when you get a lower than “B” grade of foie gras. One of my favorite things to do with foie scraps is to fold them into a terrine, the low cooking temperature prevents the fat from being rendered out, or make foie gras butter. The butter is great because of its versatility and its amazing flavor. I mean come on, its butter and foie gras! The recipe below has been adapted from the following site The Chopping Block. At the chopping block they use all foie gras, which is perfectly acceptable, but I do enjoy the flavor of the butter being substituted for half of the foie gras. Place the foie gras and butter in a food processor and blend until smooth. This step is optional, place the butter on a sieve and press it through using a rubber spatula. This process will remove larger chunks that did not get pureed and sometimes if there are chunks of foie the fat will render out while baking and could cause the shortbread to spread into a thin mess. If you are going to use the butter as is, I recommend using it on top of steaks and adding truffles, sea salt and black pepper. To do this, after the steps above, place the foie butter in a mixing bowl and fold in the your choice of ingredients to your liking. On a piece of plastic wrap or wax paper, scoop out the foie butter and place it on the front third of the plastic, spread it the length of the plastic, side to side, leaving two inches of plastic on both sides. Then take the end of plastic nearest you and pull it over the butter and start to roll the butter along the table in the plastic. You are essentially make a log of butter, then grab the ends and lift and roll the butter on the counter to twist of both ends. Place the butter in the fridge or freezer for later use, if freezing be sure to place it in the fridge 24 hours before use. Place the foie gras butter into the bowl of a stand mixer with the sugar, balsamic, and black pepper. Cream until well combined. Add the flour to the mixing bowl and carefully mix until well combined, you will need to scrape the bowl to ensure an even mixture. Remove the dough from the bowl, wrap in plastic, and place in the fridge to chill. 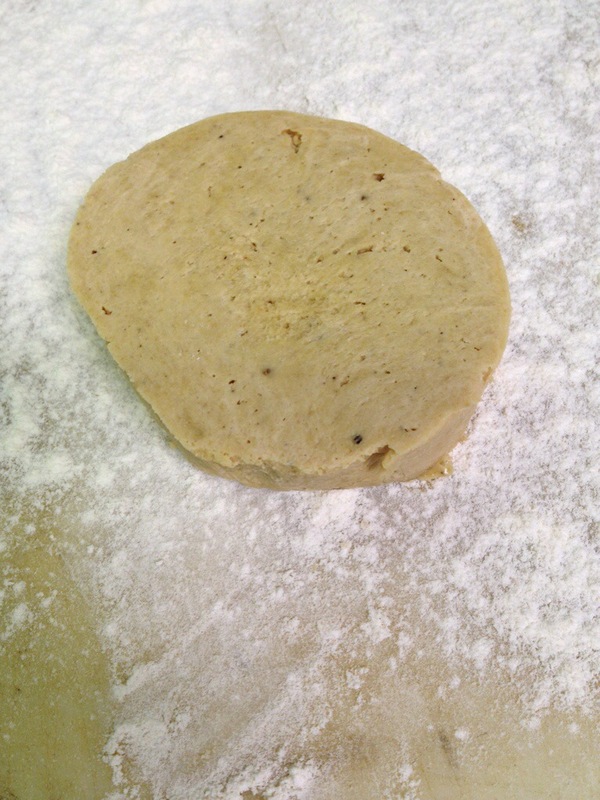 Roll the dough to the desired thickness and cut to fit the dish it will be served with. 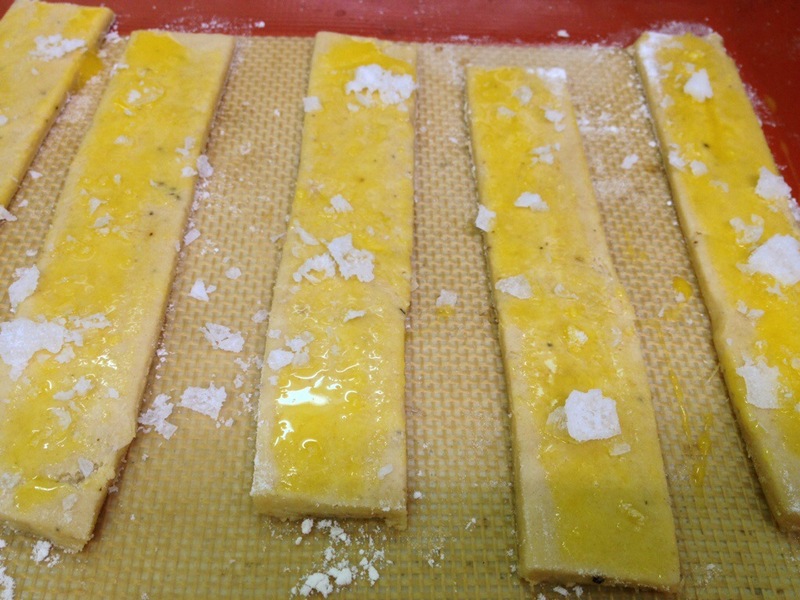 Beat the two egg yolks then place the dough onto a parchment lined baking sheet and brush with the egg. Sprinkle with the sea salt or flaked salt and bake for approximately 20 minutes, may take longer in conventional ovens. 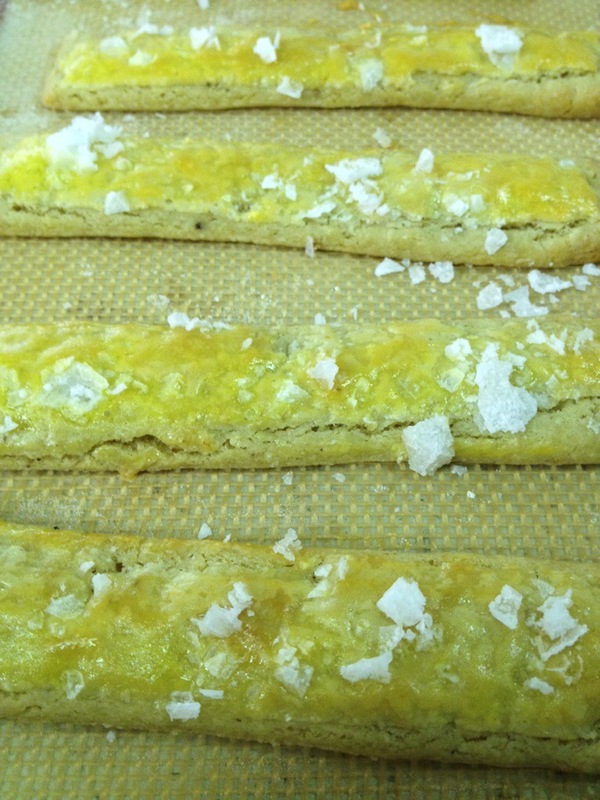 The foie gras shortbread cookies go great on Caesar salads or on their own. 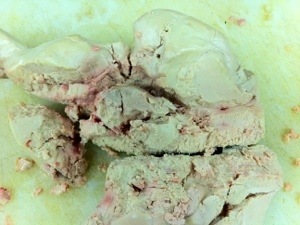 During the summer months we use foie gras as much as we can. I have made torchons and I have simply cut thick slices and seared them in a hot pan and drizzled them with balsamic or a sweet soy and enjoyed it with a spoon. It took me a few years of culinary school and a couple of restaurants to really appreciate foie and its flavor. The most important thing to remember when eating foie, are the accompaniments, if they don’t pair well then it can be hard to enjoy. When making a torchon I will usually stick to a “B” grade liver. The difference between the grades are as follows. 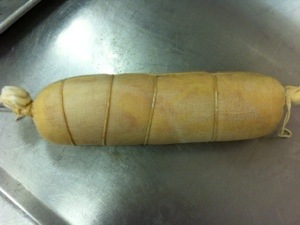 Grade “A”, from france, is the best foie that you can buy, it will be nice and plump and will have no veins in the center. France has set strict regulations for the production of foie that are not in place in the states which allows them to have a more consistent product. Grade “A” is best for slicing and cooking in a hot pan. Grade “B”, will be smaller in size and they do have a significant amount of veins that need to be cleaned out before any other processing is down. They will have some minor blemishes and it will be slightly darker in color than grade “A”. When cooked it will also release more fat than grade”A” but can be equally as good in flavor. Grade “C”, is usually hard to find as it is turned into pates and mousses. A lot of blemishes and visible veins that need to be cleaned before use. For the longest time I felt that making the torchon was difficult but only because I did not understand the process and the techniques that were involved. I have successfully made two different types of torchons from two different sources. The first was from The Modernist Cuisine books, and the second was from Michael Ruhlman. I will use a mix of both to achieve the product that I am looking for. The Foie that we buy comes frozen and vacuum packed, frozen duck liver is the best product to buy, the longer that they are out of the duck the more it breaks down and begins to get grainy, so it is important to make sure that the Foie is of high quality. Remove the foie from the bag and let it sit out for an hour, this will make it more pliable and easier to remove the veins. Once it has softened up, separate the lobes and place the smoother side down and the exposed veins facing up. 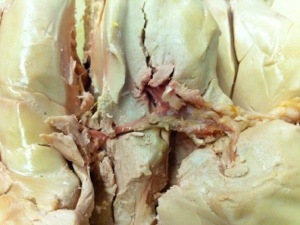 The main set of veins will be connecting the larger lobe to the smaller, as shown below. Once the lobes are separated and using the back of a pairing knife, scrape the foie near the veins and follow them until they end. You may need to make small incisions to continue following the veins throughout the lobes. 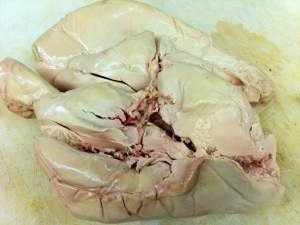 If the foie is warm enough you can usually pull the veins out or through the foie. Once the veins are removed, scrape the red spots/streaks on the foie from the veins with the back of a pairing knife just to remove any blood. Veins removed and the liver is ready to be cleaned further. At this point you may have multiple pieces, which is okay, place the foie in a pan and submerge in cold water. Place the pan of foie in the fridge for 24-36 hours. The cold water will remove any other spots of blood in the liver. The liver soaking in a pan of water and covered with a piece of plastic. After 36 hours you can remove the foie from the water and pat it dry. You will notice how clean and it looks and how solid the color is. Place the liver on a rack to air dry while you mix the remaining ingredients in the recipe to create your cure. Once all of you pieces of liver are dried place them in a vacuum bag and add your cure. 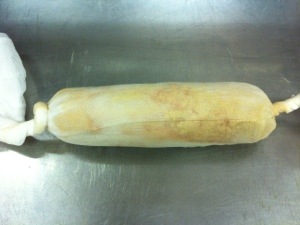 Seal the foie and refrigerate for 12 hours, I did mine overnight. If you do not have a foodsaver or a way to vacuum seal the foie then just place it in a Ziploc and be sure to flip it over every few hours to ensure that the cure hits the whole liver. 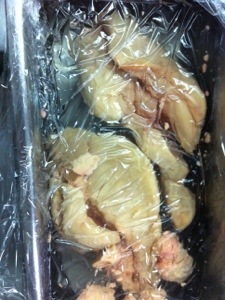 Vacuum sealed liver with cure. The following day, remove the liver from the bag and pat dry. 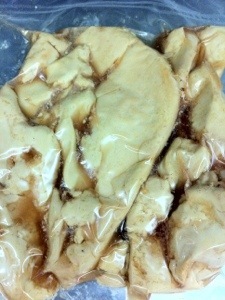 Place the foie on a piece of parchment paper or plastic wrap and let it warm up for an hour to make it more pliable. Once warmed assemble the pieces, on the parchment or plastic wrap, into a rough cylinder and roll the foie in the parchment or plastic. Grab the loose ends and roll the foie to tighten the cylinder, set aside and prepare pieces of cheesecloth approximately 12″ by 24″. 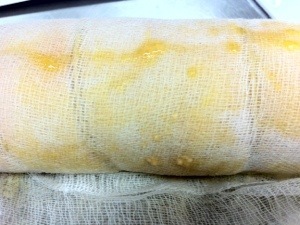 Unwrap the foie from the parchment or plastic and place it on the end of the cheesecloth closest to you. The foie may not stick in its roulade shape but try to move it carefully and you may need to put some of the pieces back in place. 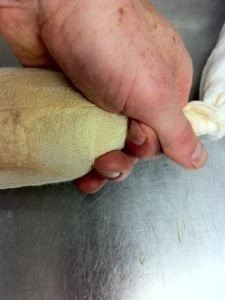 Roll the foie in the cheesecloth, to do this keep your ring and pinky fingers on the side while using your index finger and thumb to roll the foie. Once you are at the other end of the cheesecloth pinch the side and roll the foie on the table to compress it towards the center. 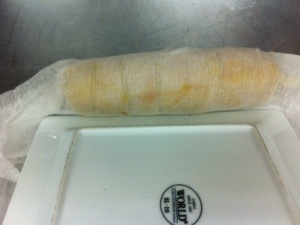 Foie rolled on the table to force the liver to the middle and to create a uniform cylinder. You will notice that the end of the cheesecloth twisted over itself on the left, this will help keep it tight while you tie the ends. Using a long piece of butchers twine, tie one end of the cheesecloth and then pinch the other end to force the liver to compact. Tie the rest of the liver like you would tie a roast. Pinching the liver towards the tied end of the cheesecloth. Tying the liver like a roast. Once you are at the other end, wrap the twine around your hand as shown below. Wrap the twine around the other end of the liver, moving the twine closer towards the liver each time around. 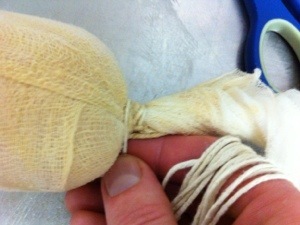 The twine was wrapped around the cheesecloth multiple times towards the liver to ensure it is nice and compact. Now that the liver is wrapped nice and tight put a pot of water large enough to hold the foie on the stove and bring it to a simmer. While waiting for the water, prepare an ice bath to shock the liver in after poaching it. Once the water is at a simmer carefully place the liver in it and poach for 90 seconds. This 90 seconds will melt the fat and fill in the gaps in the middle of the torchon. 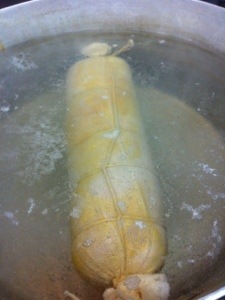 Carefully remove the foie from the simmering water and shock in the ice bath. 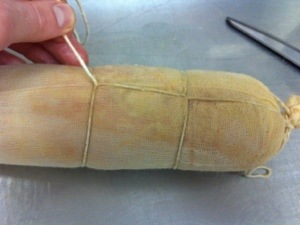 Leave it here for 5-10 minutes then remove and pat dry, leave the foie wrapped in the cheesecloth. 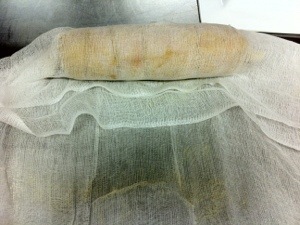 Cut another piece of cheesecloth the same size as before and place the foie on the far end, about 3/4 of the way down. Fold the remaining piece of cheesecloth, on the far end, over the foie. 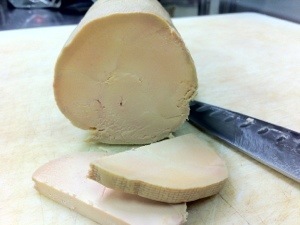 Using a square plate, or anything stiff and straight like a wood board, place the edge under the foie. 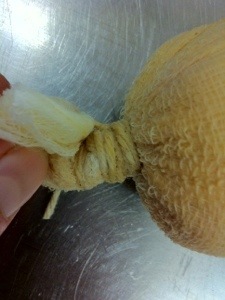 Using your other hand pull on the cheesecloth closest to you, this will tighten the liver in the cheesecloth. You will notice some of the fat coming through the cheesecloth, this is good. 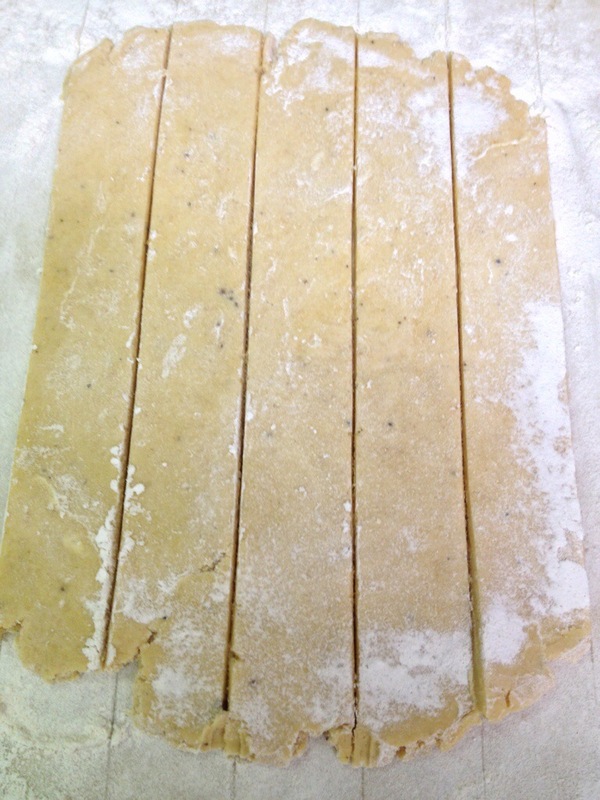 Roll in the remaining cheesecloth and tie both ends leaving a loop in one. Hang the liver in the refrigerator for 24 hours. Remove the foie from the refrigerator and the cheesecloth, slice thin and enjoy on toasted brioche. The plate at the top of this post can also be seen here. Another pâté to add to the collection, this one has some seasonality to it with the huckleberries. Fresh huckleberries have been popping up in the past few weeks and they are delicious. You can certainly use frozen huckleberries from the previous season or buy a bundle and freeze them yourself for future culinary endeavors. I used the same base recipe from previous pâté ventures, but I made some small changes. The biggest change was the protein, we had a mass amount of pigs this summer, therefore, the protein was changed to pork. The pork that I had was very lean so I added some chilled pork fat. The liver will remain as duck, and the same general spices will be used. The addition of lobster mushroom powder will add some earthiness, not that it needs a lot more, and the huckleberries add a nice savory fruit note that can mellow the salt quite a bit. The last item that was added were hazelnuts, we recently started buying hazelnuts from a local roaster in Eugene, OR by the name of Evonuk Oregon Hazelnuts. They deal mostly in wholesale but their products are not to be passed up. Their hazelnuts are carefully picked and are very consistent, they have a very nice floral note that I have never tasted in a hazelnut. 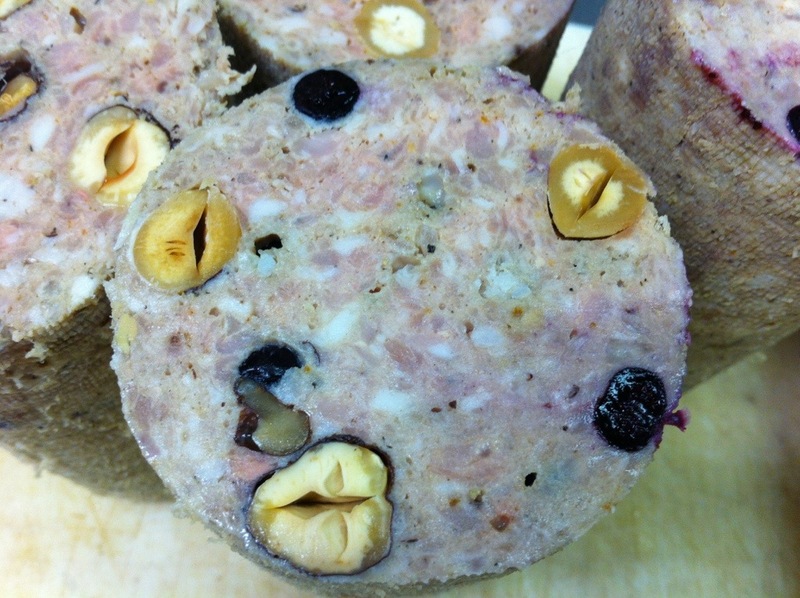 Follow the same process as the duck pate using your new recipe above. You will hand fold the huckleberries, mushroom powder, and hazelnuts in after you have added the panade and mixed the forcemeat in the mixer.